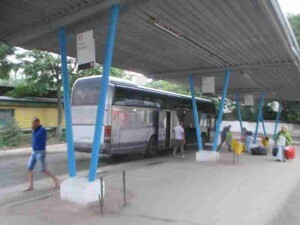 This is the bus from Bucharest that brought me to Chisanau. You can see it’s rather large. I was told that there was a bus that left Bucharest for Chisanau every hour or so from early in the morning until midnight. Most of them were minivans that carried 15-20 people. This one carried closer to fifty people. It was over half full. It cost me $22 and nine hours of my time to ride it. At the borders there were guys who got on and took our passports who spoke fluent Russian and a smattering of English words. I think I was the only one on the bus who could speak good English and could not speak Romanian or Russian. That’s my definition of well-traveled – you’re the only one on the overnight bus who can speak English and not speak the local language. I have to admit that this trip wasn’t nearly as bad as the last overnight bus ride I had. This driver wasn’t trying to throw me off my seat every chance he got.